With the future coming up fast, the military is starting to rely more and more heavily on the advanced use of technology. This includes everything from hi-def cameras, drones, and lasers. You heard it correctly – LASERS. Amazing technology continues to surface everyday and it never ceases to amaze me or anyone for that matter. The latest in military advancement is ‘Laser Weapons System’ or ‘LaWS.’ LaWS is a six-laser cannon that fires a focused fiery beam towards its target, specifically drones. Isn’t technology amazing? Here at Accessory Genie we have a similar product to LaWS although we cut the price significantly. Our ENHANCE GX-M1 High Precision 6-Button Optical Gaming Mouse sends the same type of destructive lasers with the click of a button. Our lasers may not be as powerful but they fire straight through the mouse wire onto your computer screen to dip, jump, dodge, and shoot at your opponents in milliseconds. Like I said isn’t technology amazing? I also mentioned the significant price cut. Unlike the millions to billions the military will charge you, Accessory Genie is offering a price reduction starting April 28th and running through May 5th. Use the coupon code ‘GMXMOUSE’ at checkout and receive your Gaming Mouse for only $16.99 with free shipping. Now that’s a deal! A serious gamer needs serious equipment – enter the ENHANCE GX-M1. Switch weapons, toss a fireball, or order your squad without moving your cursor! You can quickly customize your game play with 5 easy-to-reach buttons designed for your macros and hotkeys, or change your DPI setting in seconds! The DPI switches from 1200, 2400, and 3500 DPI to give the perfect range of sensitivity while playing. In addition, the premium optical sensor adds pinpoint precision and control so your cursor never slips or skips at the crucial moment. Plug-n-play functionality means no fuss with installing drivers – plug the mouse into a USB port and go! The GX-M1 is built to last but comfortable enough for LAN parties and extended gaming sessions. Equipped with a rugged braided cable and reinforced USB 2.0 plug, the GX-M1 also features ergonomically scooped sides with a soft rubberized grip. The sleek, sculpted shape is easy to grip and comfortable to use so you can furiously click and drag as long as you want to without threat of damage or discomfort. Want to add some flash to your setup? The GX-M1 sports three color-blending LEDs that shift through a kaleidoscope of 7 different hues. 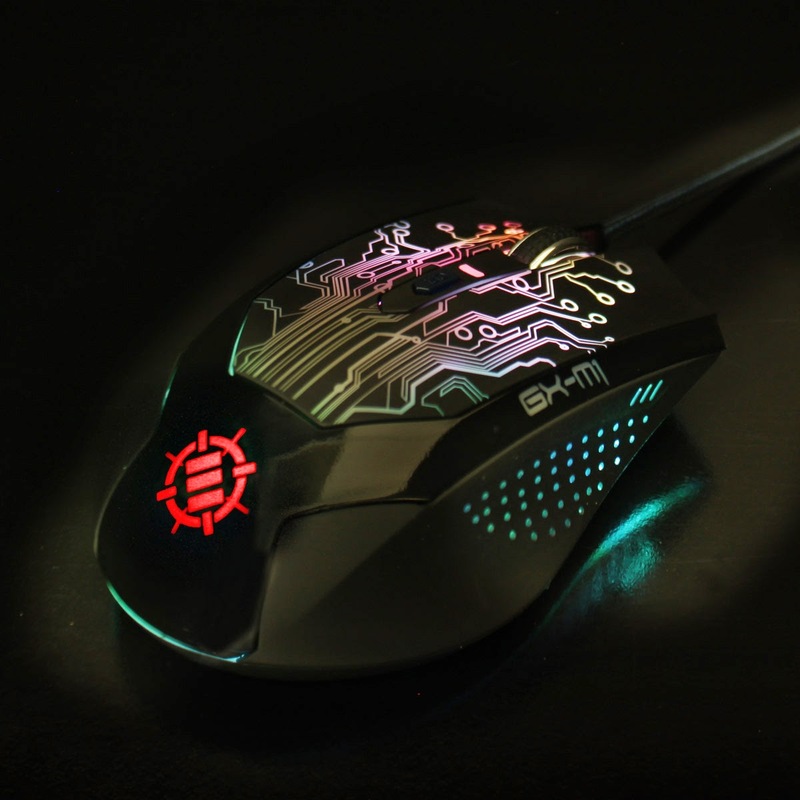 The mouse also comes with an LED shutoff switch on the bottom so you can play without visual distraction. The choice is yours! Remember with great power comes great responsibility. Be sure that your GX-M1 is plugged into the computer before clicking to prevent any accidents. Also, use the coupon code ‘GMXMOUSE’ at checkout to receive the special discount and free shipping. The offer is good from April 28th through May 5th. Quality is always guaranteed with a 3 Year Manufacturer’s Warranty!